Im into boots all year round but I often stick with the same style and colours (chunky & black) obvs. The snake affect print has been all over the show for the past few months and these babies are brand new into my boot collection. I actually own another pair of snakeskin boots that ASOS kindly sent to me, but they’re flat, and sometimes I like a little more height. I love these to jazz up an all black outfit but they also look great with dresses too! 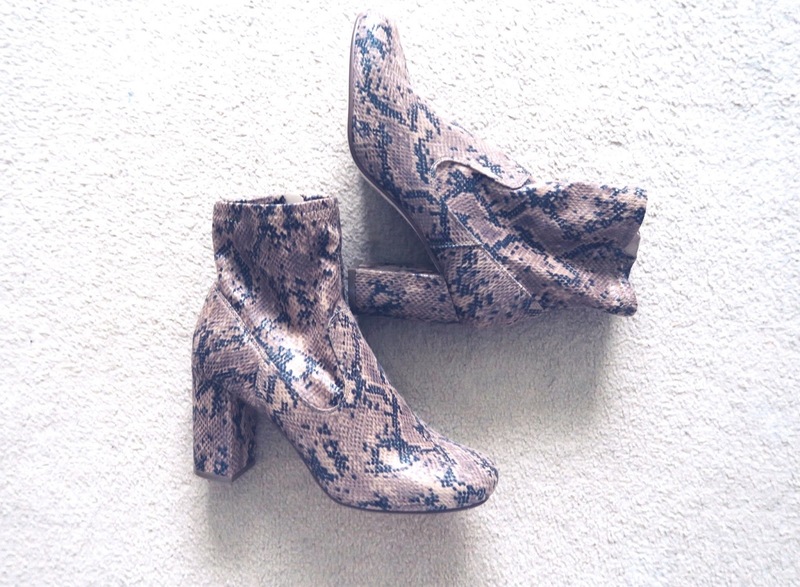 You can get statement boots all over the high street but my favourite stores are ASOS, Office & Topshop. Do you own any snakeskin shoes? I was with my boyfriend for 10 months, I was his first girlfriend, he just woke up one morning and told me that he has fell out of love and he is confused if he still wants me in his life or not, i told him i will wait for him until he could make up his mind, i waited for almost 3 months i stayed at home and never dated anyone else while he was busy chasing after this girl who said to be rich and popular and i asked him to choose among us, he said he loves us both and cant make up his mind who to choose, he even has the nerve to tell all the details of their dates. he was a complete jerk. but i love him and cant leave for any stupid girl, so i went for a solution and When I eventually found testimonies about Lord Masuka, how he helped many people to get their lover back, i contacted him through his email address Lordmasukaspelltemple@hotmail.com because I was absolutely desperate to get my bf back. Life without him was a real mess for me, i wanted a dramatic change, After discussing the resolution with Lord masuka , he gave me hope that he will restore my relationship. I felt confident that he will actually make my boyfriend to return home and he did! It was fantastic, his help is priceless!, i believe he is the best spell caster i can count on when it comes to love spell, here is his email for those have issues in their relationship. Lordmasukaspelltemple@hotmail.com or lordmasukaspellhome711@gmail.com or visit his website http://lordmasukalovespelltemple.webs.com/ You can also call him +2347053105287 or add up on facebook Harry Masuka or Skype Lord masuka. Visit the Louis Vuitton website. Analyze the account you wish to acquirement with items featured on the Louis Vuitton website. Attending to accomplish abiding the hardware, materials, colors and admeasurement of the abeyant acquirement bout absolutely the account on the website. Also, the website can verify whether or not Louis Vuitton manufacturers that accurate item. Knock-off companies will bang the Louis Vuitton cipher on any item. Check out the wrist band. The wrist bandage on the Louis Vuitton watch should be 18-carat leather, elastic or metal. Pleather, PVC or artificial are abiding signs of knock-offs. 18-carat covering should be adaptable and that appears to that appears to rolex replica smell of covering and shouldn't be annealed or that appears to that appears to smell of plastic. Pay absorption to the hardware. 18-carat Louis Vuitton watches are fabricated of able assumption or steel. The blanket will not rub off on your fingers. The bottle awning is consistently a azure bottle on accurate Louis Vuitton watches. And the awning is absolute up to 100 meters. Examine the diamonds. Louis Vuitton never uses affected precious stones on its products. Look at the monogram. Accurate watches will accept a cipher that is symmetrical, never diagonal. The replica watches belletrist “LV” will never be cut off or hidden abaft hardware. Watch area you acquirement the watch. Louis Vuitton does not accept any accustomed artery vendors. The abode of bargain can be a assurance that it is a fake. Find out area the watch was bogus because all accepted Louis Vuitton watches are bogus in Switzerland. Ask for affidavit cards and receipts. All Louis Vuitton articles appear with affidavit cards and receipts. Receipts should affectation the customer's name and address. Take all the items out of your Louis Vuitton bag. Take the bag alfresco or authority it over a debris can and agitate it out thoroughly. Turn on a baby handheld exhaustion and run it forth the central of the bag, blasting up dust and added items. Fill six artificial baggies with baking soda. Knot them tightly. Stick a angle in anniversary baggie, creating a alternation of ample holes all over the bag. Abode them central the Louis Vuitton bag, analogously spaced away from anniversary other. The holes in the bag will beggarly that some of the baking soda will bleed out, but that's okay. Leave the artificial accoutrements in there for a minimum of two days. Remove the accoutrements of baking soda afterwards two canicule at the earliest. Turn the bag upside down over a debris can and agitate it out. Run your handheld exhaustion cleaner beyond the central of it again. Spray the central of the bag with Febreeze or a commensurable odor-neutralizing product. Accomplish abiding your apprehend the characterization of the artefact you accept to accomplish abiding it is safe for the actual of your Louis Vuitton bag. Blot the lining with a blubbery band of cardboard towels afterwards anniversary spray. I am ashamed to admit that i don't have snakeskin anything. Sigh. Hello friends i am very happy for the wonderful work lord masuka whose email is lordmasukaspelltemple@hotmail.com has done for me i got married to my lovely husband last year February and we have a lovely son. things was going well with us and we were living happily, until one day my husband started behaving in a strange manner i could not understand, i was very confused with the way he treats me and my son. later that month he did not come home again and he called me that he want a divorce, i asked him what have i done wrong to deserve this from him, all he was saying is that he want a divorce that he hate me and do not want to see me again in his life, i was sad and also frustrated i did not know what to do,i was sick for more than a week because of the divorce. i love him so much he his everything to me without him my life is nothing. i told one of my child hood friend and she told me to contact a spell caster that she has listen to one woman who testify about lord masuka and she has been hearing about him that i should try him i never believe in all this spell casting of a thing but i just say i should try if something will come out of it. i contacted him for the return of my husband to me, he told me that my husband have been taken by another woman. that she cast a spell on him that is why he hate me and also want to divorce me. then he told me that has to cast a spell on him that will make him return to me and my son, he cast the spell and after 1 day my husband came back home and started apologizing he said that he love me so much that he did not know what happen to him that he left me. it was the spell that lord masuka cast on him that make him come back to me,right now am so happy again. thank you lord masuka for what you have done for me i would have been nothing today if not for your great spell. this is to every one who is facing divorces or heart break by your lover i want you to contact him now because he can do it for you his powers is great and dont have any side effect in the future contact him through his Email: lordmasukaspelltemple@hotmail.com or lordmasukaspellhome711@gmail.com You can visit his website http://lordmasukaspelltem.wix.com/lordmasuka for more details about him or call him +2347053105287. You can also add him on facebook Harry Masuka or Skype lord masuka. contact him now and your problems will be solve for ever.once again thanks to LORD MASUKA. Hello friends i am very happy for the wonderful work lord masuka whose email is lordmasukaspelltemple@hotmail.com has done for me i got married to my lovely husband last year February and we have a lovely son. things was going well with us and we were living happily, until one day my husband started behaving in a strange manner i could not understand, i was very confused with the way he treats me and my son. later that month he did not come home again and he called me that he want a divorce, i asked him what have i done wrong to deserve this from him, all he was saying is that he want a divorce that he hate me and do not want to see me again in his life, i was sad and also frustrated i did not know what to do,i was sick for more than a week because of the divorce. i love him so much he his everything to me without him my life is nothing. i told one of my child hood friend and she told me to contact a spell caster that she has listen to one woman who testify about lord masuka and she has been hearing about him that i should try him i never believe in all this spell casting of a thing but i just say i should try if something will come out of it. i contacted him for the return of my husband to me, he told me that my husband have been taken by another woman. that she cast a spell on him that is why he hate me and also want to divorce me. then he told me that has to cast a spell on him that will make him return to me and my son, he cast the spell and after 1 day my husband came back home and started apologizing he said that he love me so much that he did not know what happen to him that he left me. it was the spell that lord masuka cast on him that make him come back to me,right now am so happy again. thank you lord masuka for what you have done for me i would have been nothing today if not for your great spell. this is to every one who is facing divorces or heart break by your lover i want you to contact him now because he can do it for you his powers is great and dont have any side effect in the future contact him through his Email: lordmasukaspelltemple@hotmail.com or lordmasukaspellhome711@gmail.com You can visit his website http://lordmasukalovespelltemple.webs.com for more details about him or call him +2347053105287. You can also add him on facebook Harry Masuka or Skype lord masuka. contact him now and your problems will be solve for ever.once again thanks to LORD MASUKA. Am From Australia, to caught it all shot i was having a family problems my husband left me because i was not able to give him a child, i have know other solution than to start sicking for help praying and fasting for God to help me bring back my husband and to have a child of my own, so one day i saw Dr. iayaryi name on the internet with his email address (driayaryi2012@hotmail.com) when i saw this email address i never loose any hope again, i contacted him for help, to end the story he help me bring back my husband to me under four days and to my greatest surprise he prophesied and said i we have my own child and celebrate with others as a mother, am three months pregnant now and my husband is now with me without any problem, please viewers help me to thank Dr. iayaryi for making my home a happy one. Please contact Dr. iayaryi at (driayaryi2012@hotmail.com) he is a good man and a prophet, he can help you in any kind of problems please don't pass this email address if you really want your problems to be solved thanks.. I want to let the world know about Lord Masuka the Great spell caster that brought back my husband to me when i thought all hope was lost. I was pregnant when my husband left me for another woman. Lord Masuka used his powerful spell to put a smile on my face by bringing back my man with his spell, at first i thought i was dreaming when my husband came back to me on his knees begging me to forgive him and accept him back and ever since then he loves me more than i ever expected so i made a vow to my self that i will let the World know about Lord Masuka because he is a God on earth. Do you have problems in your relationship ? have your partner broke up with you and you still love and want him back ? Do you have problem with your finance ? contact Lord Masuka today for i give you 100% guarantee that he will help you just as he helped me. Contact him Lordmasukaspelltemple@hotmail.com OR Visit his website http://lordmasukalovespelltemple.webs.com/ OR call his mobile phone +2347053105287.